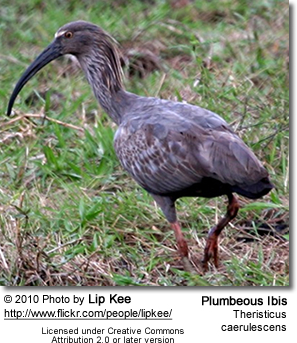 The Plumbeous Ibises (Theristicus caerulescens) are South American ibises. Plumbeous Irises are fairly common in parts of their range, which extends from central South America to south-central and south-eastern Brazil, eastern and northern Bolivia, Paraguay, Uruguay and northern Argentina. They inhabit grassland, savanna, fields and marshes. They are usually seen alone or in pairs. 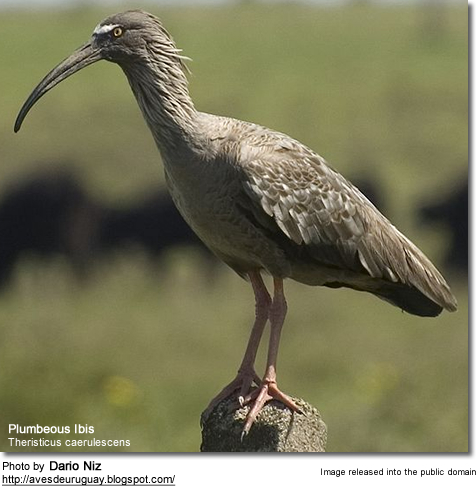 This distinctive ibis has a mostly grey plumage with a white band on the forehead and long plumes on the nape and neck. The bill is blackish and the legs are reddish.